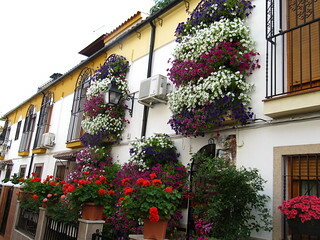 In Córdoba, the traditional houses are built around a central patio or courtyard with wells and fountains. This is a roman heritage that help to keep the house cool. For the same reason and not just for decoration, the patios are filled with plants and flowers. Due to the beauty of them, a courtyard contest began to be held in the city in the second decade of the Twentieth Century . During almost two weeks of May, the “patios”, which take part in this contest, are opened so that visitors may enjoy their colourful flowers and other decoration such as beautiful mosaics and ceramic.